Subject: Grant of Fixed Medical Allowance (FMA) to the Armed Forces Pensioners / Family Pensioners in such cases where date of retirement is prior to 01.04.2003 and who had opted not to avail medical facilities at OPD of Armed Forces Hospitals/ MI Rooms and are not members of ECHS. 2). GOI, MoD letter No. 1(10)/2009-D(Pen/Policy) dated 29th August’ 2017. 2. In terms of Para-1 of GOI, MOD letter dated 29th August’ 2017, the fixed medical allowance has been enhanced from ? 500 / - pm to ? 1000 /- pm with effect from 01.07.2017. Ex-Servicemen who retired after 01.04.2003 have to become member of ECHS compulsorily and are not eligible to draw Fixed Medical Allowance. However, Pre-01.04.2003 retirees have the option of either joining the Scheme or draw Fixed Medical Allowance as per the extant rates. 1. The Dy. Secretary, Govt. of India, Ministry of PPG & P(Deptt. of P&PW), Lok Nayak Bhawan, New Delhi. 2. Director (Pensions), Govt. of India, Ministry of Defence D (Pen/Sers), Sena Bhawan, Wing ‘A’ New Delhi. 3. Army HQrs AG’s Branch, PS-4(b) DHQ, PO New Delhi- 110011. 4. AHQ GS Branch, TA Directorate, DHQ PO New Delhi- 110011. 5. Naval HQrs, PP & A, DHQ PO New Delhi. 6. DPA, Vayu Bhawan, New Delhi- 11. 7. Air HQrs Ad PP & P- 3, West Block-VI, R. K. Puram, New Delhi- 110066. 8. Sr. Dy. CGDA(AT-II), O / O the CGDA, Ulan Batar Road, Palam Delhi Cantt- 110010. 9. PCDA (Navy) No.-1, Cooperage Road, Mumbai- 400039. 11. CDA (AF), West Block-V, R. K. Puram, New Delhi- 110066. 14. ICDA (AF) Subroto Park, New Delhi- 110010. 16. All Record Offices/ Regiment/ Corps. 17. Naval Pension Office, C/o INS Tanaji, Sion Trombay Road, Mankhurd, Mumbai-400088. 18. Air Force Record, Dhaula Kunwa, Delhi Cantt. 19. Director MP8(I of R)Integrated HQ of MOD(Army)AG’s Branch, Addl Dte Gen of MP/MP8(I of R) West Block-III, RK Puram ,New Delhi 110066. 20. All Add] CsDA/ It. CsDA in Main Office. 21. All GOs in Main Office. 23. All SAOs/ AOs/ AAOs in Gts/ ORs Complex. 24. The OI/C, EDP Manual Service Section. 25. The OI / C, EDP Centre for modification of software. 27. The O I / C, EDP Centre (Website) for uploading the circular on the office website. 30. The O I/C, DPTI. 31. The O I/C Pension Call Centre. 33. The O I / C Defence Pension Liaison Cell. 34. The O I / C Reception. The undersigned is directed to refer to the Govt. of India, Ministry of Defence letter No. 1(1)/98/D(Pen/Sers) dated 15th June 1998 and letter No.1(10)/09-D(Pen/Policy) dated 12th January 2011 & No. 1(10)/2009-D(Pen/Policy) dated 5th May 2015 regarding grant of Fixed Medical Allowance (FMA) of Rs.500/- pm. with effect from 19.11.2014 to Armed Forces Pensioners/Family' Pensioners for meeting expenditure on day to day medical expenses that do not require hospitalization unless the individual had opted for OPD treatment in Armed Forces Hospitals/ M.I. Rooms and convey the sanction of the President for enhancement of the amount of FMA from Rs. 500/- to Rs. 1000/-per month. The other conditions for grant of FMA shall continue to be in force. 2. Ex-Servicemen who retired on or after 01 Apr 2003 have to-become member of ECHS Compulsorily and are not eligible to draw Fixed Medical Allowance. These orders applicable only in such cases, where the date of retirement is prior to 1.4.2003 and who had opted not to avail medical facilities at OPD of Armed Forces Hospitals/ Ml rooms and are not members of ECHS. As per the standard distribution list. 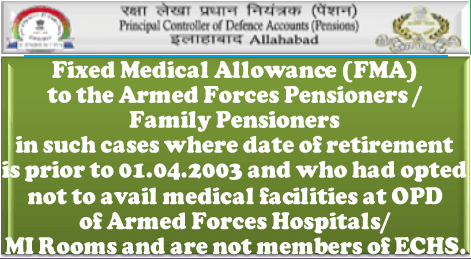 Grant of Fixed Medical Allowance (FMA) to the Armed Forces Pensioners / Family Pensioners in such cases where date of retirement is prior to 01.04.2003 and who had opted not to avail medical facilities at OPD of Armed Forces Hospitals/ MI Rooms and are not members of ECHS.